The weak interaction is responsible for radioactive decay, including the above Beta-minus decay. The weak interaction (the weak force or weak nuclear force) of particle physics is one of the four known fundamental interactions of nature, alongside the strong interaction, electromagnetism, and gravitation. The weak interaction is responsible for radioactive decay, which plays an essential role in nuclear fission. In his theory of beta reactivity Fermi introduced a new type of interactions among elementary particles, which today we call "weak interactions". Many new manifestations of weak interactions, which could be interpreted using Fermi's 1933 theory, were found in the following decades. The study of weak interactions has led to surprising discoveries, among which the violation of specular symmetry (known as parity symmetry or P symmetry), and the violation of time reversal symmetry (T symmetry) and of the symmetry between matter and antimatter (CP symmetry). Nicola Cabibbo, "Weak Interactions," Enrico Fermi: His Work and Legacy (2001) ed., Carlo Bernardini, Luisa Bonolis. The... weak force... couples to both quarks and leptons, and is very short-ranged due to the large rest mass of the messenger quanta involved. Its effective strength is usually many orders of magnitude weaker than electromagnetism, and its action can cause particles to change identity, as when a neutron decays. Unlike the electromagnetic and strong forces, the weak force violates parity conservation. Paul Davies, Forces of Nature (1986) p. 145. For the weak force... universality of coupling strength is not readily apparent. Hadronic weak forces are very different in nature from leptonic weak processes. How can neutrinos be produced in the center of the sun and how can they be detected in laboratories here on earth if they are subject neither to the strong force nor to the electromagnetic one? Another force, the so-called weak force, is responsible. The electron neutrino does participate in that interaction, along with the electron. Murray Gell-Mann, The Quark and the Jaguar: Adventures in the Simple and the Complex (1994) p. 187. Murray Gell-Mann, The Quark and the Jaguar: Adventures in the Simple and the Complex (1994) pp. 188-189. In 1952... I tried to explain the behavior of the new "strange particles," so called because they were copiously produced as though strongly interacting and yet decayed slowly as though weakly interacting. (Here "slowly" means a half-life of something like a ten billionth of a second... a strongly interacting particle means... a ten trillionth of a second, roughly the time it takes for light to cross such a particle.) ...I thought of assigning these strange particles isotopic spin I = 5/2... But the notion failed to work... I was invited to talk at the Institute for Advanced Study... By a slip of the toungue I sad "I = 1" instead... Immediately I stopped dead, realizing I = 1 would do the job. ...But what about the alleged rule that fermionic strongly interacting particle states had to have values of I like 1/2 or 3/2 or 5/2? ...the rule was merely a superstition... unnecessary baggage that had come along with the useful concept of isotopic spin... [which now] could have wider applications than before. ...[T]he strange particle states differ from more familiar ones such as neutron or proton or pions by having at least one s or "strange" quark in place of a u or d quark. Only the weak interaction can convert one flavor of quark into another, and that process happens slowly. Murray Gell-Mann The Quark and the Jaguar: Adventures in the Simple and the Complex (1994) pp. 262-264. The strong and weak forces are less familiar because their strength rapidly diminishes over all but subatomic distance scales; they are the nuclear forces. This is why these two forces were discovered only much more recently. The strong force is responsible for keeping quarks "glued" together inside of protons and neutrons and keeping protons and neutrons tightly crammed together inside atomic nuclei. The weak force is best known for the radioactive decay of substances such as uranium and cobalt. In 1933 Enrico Fermi suggested that beta radioactivity, and the manner in which the neutron spontaneously decayed, could be described using a formalism similar to that developed by Dirac for the electromagnetic force, but 10-10 times weaker. With its range of only about 1/1,000th the diameter of the nucleus, it could not play a role in binding the nucleus, but it could affect individual nucleons. The fact that the metastable particles exhibited the same characteristic time of 10-10 second indicated that this weak force acted on many types of particles. ...a 'characteristic time' ...being the time for an interaction across a nucleus 3 fm in diameter; an event taking place in a shorter time [than 10-23 seconds for the strong force] has 'no meaning'. ...For electromagnetic interactions, the strength is 10-3 of the strong force, and so the characteristic time is longer (10-20 [seconds]); this is roughly the time for a photon to cross an atom. David M. Harland, The Big Bang: A View from the 21st Century (2003) p. 66. Feynman Diagram of the most common of muon (μ-) decays into a muon neutrino, an electron antineutrino, and an electron, via the W - boson. In addition to transforming a neutron into a proton and vice versa, the weak force was evidently responsible for the decay of a muon into an electron. ...[W]hen the strange particles were found to decay without neutrinos it was realized that the force was more complex than had been posited in Fermi's theory of beta decay. Nevertheless, the fact that aspects of the force could be explained by an electromagnetic formalism implied that these forces shared an underlying symmetry. Vincent Icke, The Force of Symmetry (1995) p. 264. Nicholas Mee, Higgs Force: The Symmetry-breaking Force that Makes the World an Interesting Place (2012) pp. 74-75. [W]hat shall we say, then, to a nuclear event such as... beta decay... in which a neutron turns into a proton and also shoots out an electron together with an antineutrino? ...Coming from within... is the weak interaction. Not in all nuclei, but certainly in many... the weak interaction sometimes subverts the neutrons and protons bound otherwise so strongly. It takes only a change in flavor. The weak force, with the weak interaction charges as the source, transforms a down quark into an up quark and hence a neutron into a proton. At the same time, an electron and antineutrino spring loose... The strong force plays no part here, since neither the electron nor the antineutrino carries a strong interaction charge. Electrically neutral, the antineutrino escapes the electromagnetic force as well. ...the weak force ...allows a neutron to decay into a proton, electron, and antineutrino. The four particles all carry weak interaction charges, and their common endowment makes them all actors in a single play. Michael Munowitz, Knowing: The Nature of Physical Law (2005) pp. 33-37. Neutrinos were among the most paradoxical members of the zoo of elementary particles that were discovered after the war. Produced during radioactive decay, they supposedly had neither charge nor mass and they traveled, consequently, at the speed of light. Their only interaction with the world (besides gravity) was by something called the "weak" force, which causes some kinds of radioactive decay. It was so weak that, according to calculations, a typical neutrino could pass through a million miles of water unhindered—stars and planets were transparent to them. Dennis Overbye, Lonely Hearts of the Cosmos: The Scientific Quest for the Secrets of the Universe (1992) p. 198. 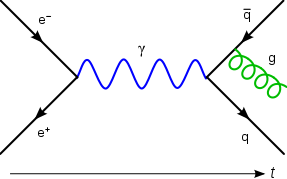 Feynman diagram of a Quantum Electrodynamic (QED) photon exchange interaction (as opposed to a W boson exchange in a weak interaction): electron and positron annihilate, producing a photon (blue wave) that becomes a quark–antiquark pair. The antiquark radiates a gluon (green helix). Antoine-Henri Becquerel discovered radioactivity. Becquerel's discovery preceded J. J. Thomson's... electron by one year. Radioactivity comes in three kinds, called alpha, beta, and gamma. ...only one ...(beta) has to do with the weak interactions. Today we know that the beta rays were actually electrons emitted by neutrons in the uranium nucleus. 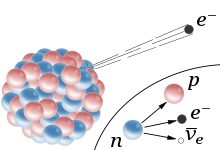 ...Nothing in QED or QCD explains how a neutron can emit an electron and become a proton. ...Becquerel didn't know ...that another particle flew off... the antiparticle of the ghostly neutrino. ...The neutrino ...doesn't emit photons. It doesn't emit gluons. This means it [does not experience the respective electromagnetic or strong forces] that electrically charged particles or quarks experience. The W-boson is key to the neutrino's activities. Not only can the electrons and quarks emit W-bosons—so too can the neutrino. ...[O]ne of the two d-quarks in a neutron can emit a W-boson and become a u-quark, thus turning a neutron into a proton. ...the W-boson is exchanged, where in a QED diagram, the photon would be exchanged. ...weak interactions are very closely related to the electric forces due to photons. ...The W-boson... splits into two particles: an electron and a neutrino "moving backward in time,"... an antineutrino. That's what Becquerel would have seen... had he had a powerful enough microscope. The weak force does not seem to hold anything together, only to break it apart. ...we do not observe bound states of the weak force. ...So the weak force seems a force apart... Interwoven with the surprising story of the weak force has been the story of neutrinos, arguably the most intriguing of the fundamental particles. ...the neutrinos provide a unique and valuable mirror on the weak force. ...In the 1920s, Lise Meitner and James Chadwick for a while disputed the energy spectrum of electrons emitted in β decay. ...Chadwick demonstrated... that the spectrum was continuous, i.e. the electron could take on a whole range of energies. ...contrary to the single line expected from energy conservation if only... the electron and the nucleus, were involved... Neils Bohr advocated abandoning energy conservation... but in 1930 Wolfgang Pauli daringly proposed an unseen... neutrino... Pauli's intuition... inspired Enrico Fermi in his 'tentative theory of β decay'... to become the basis for ideas of a universal weak force. Christine Sutton, "Weak Interactions," The Particle Century (1998) pp. 84-85. The first intimations that β decay is but one manifestation of some deeper fundamental interaction came during the 1940s from experiments which led to the discovery of the muon. ...A third charged lepton, the tau, and three nuetral neutrinos bring the number of family members to six. In addition there are six corresponding antiparticles. It appears that in any interaction a lepton can be created (or can disappear) only together with an antilepton. This empirical rule of 'lepton conservation'... implies... that it is an antineutrino that accompanies the electron in β decay. ...When the decay or capture of a muon was treated in the same way as β decay in Fermi's theory, the coupling constants... appeared remarkably similar. ...The agreement between the coupling constants for β decay, muon decay and muon capture led to the idea of a 'universal Fermi interaction' and... experiments began to reveal more and more new particles with similar weak interactions. Christine Sutton, "Weak Interactions," The Particle Century (1998) pp. 85-86. Why can stars do better than the big bang? ...During the big bang, there were only a few minutes when nuclei could form. Very rare processes, or slow ones, played little role. A case in point is the key process from which the sun derives its energy. In this reaction, two protons collide to produce a deuterium nucleus, a neutrino, and a positron. ...This reaction belongs to the family of weak interactions. ...It remains... a remarkable—and for humanity, remarkably fortunate—circumstance that the central reaction that drives the sun is so rare. It is only this extraordinary rarity that allows the average proton in the sun to last so long, billions of years, even though it is colliding with other protons millions of times a second. ...an entertaining example of Treiman's theorem. Frank Wilczek, Betsy Devine, Longing for the Harmonies: Themes and Variations from Modern Physics (1987) Ch.10 Cooking with Gobar. Once helium burning has occurred... the next possible reaction—carbon burning—is not necessarily slow... This reaction involves ...a strong as opposed to a weak interaction. ...Carbon burning results in magnesium. ...Taking a cross section of a highly evolved star would reveal a system of many layers. The inner layers have been subjected to the largest pressures, thereby forced to the highest temperatures, and burned the furthest; the outermost layers, by contrast, have not burned at all. Thus, as we proceed from outside in, there will be an outermost layer with the initial mix of hydrogen and helium, a layer of mostly helium, a layer of carbon, a layer of magnesium, and so on. ...So we arrive at the picture of a star, in the latest stages of its evolution... now composed of mostly carbon nuclei and other explosive material. Frank Wilczek, Betsy Devine, Longing for the Harmonies: Themes and Variations from Modern Physics (1987) Ch.11 Explosions and Fluourescence (or, Entropy's Revenge). If grand unified theories are correct, we ought to be able to derive the relative power of the strong, weak, and electromagnetic interactions at accessible energies from their presumed equality at much higher energies. When this is attempted, a wonderful result emerges. ...in the form first calculated by Howard Georgi, Helen Quinn, and Steven Weinberg ...The couplings of strong-interaction gluons decrease, those of the [weak interaction] W bosons stay roughly constant, and those of the [electromagnetic interaction] photons increase at short distances [or high energies]—so they all tend to converge, as desired. Fundamental Forces @Hyperphysics, Georgia State University. Brian Koberlein, What is the weak force? This page was last edited on 8 April 2019, at 03:03.